While the Boxing Babes are on their way to WA with their fearless leader Coach Ben, our member Marine is getting ready for her debut amateur Boxing event this Friday at the Paddington RSL. Coach Simon has had enough of the girls showing up the boys that he has upped his training and focus for his event on August 10th at the North Sydney Leagues Club. 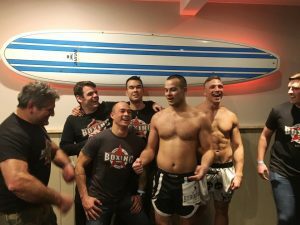 While we have a great competitive culture lets not forget that at the core we are here to help everyone get fit and have fun doing it, the byproduct is that you learn a skill along the way one we hope will take you through life. 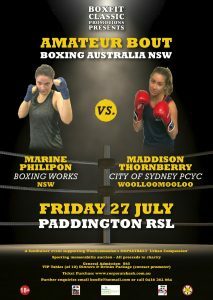 Friday 27th July, Paddington RSL Marine will take to the ring in her debut event. Marine has been training extremely hard and consistently over the last year and she is certainly ready to show us what she is made of. Being such a local venue lets show her our support and get out there on Friday to make some noise. 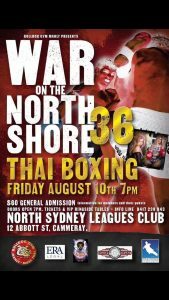 Friday August 10th, North Sydney Leagues Club. Simon has been quietly getting ready to show everyone what skill and hard work can accomplish. He has had a long break between fights, you would think work and creating a beautiful family are a good enough excuse to slacken off! It is a tough road getting back on the saddle but one we know that Simon is all over. Another relatively local venue for us so make sure you see Tim about tickets lets not miss the opportunity to show Simon that we are behind him 100%. Billy first came to Boxing Works in 2007 he has been with us for so long it is hard to remember a time he wasn’t part of the family. He is someone who trains hard, works hard, fights hard and parties hard. Kelly his gorgeous wife has been an absolute rock for Billy, having that strong support behind you is something that any fighter knows he needs. Your coach, your training partners and gym support staff are vital to your performance. When you have a partner behind you who supports and encourages you and is there every step of the way for you it is the difference. Billy Seeing the guys achieve bench marks they never thought they would, taking someone to sparring for the first time, taking someone to their first fight as with Marine this week, seeing someone lift a weight they never thought they could. Seeing the pride and happiness in them after achieving their goals. Billy Taking a huge step up in my first time out against a seasoned professional fighter and stopping him in the first round with a high lite real knock out. Billy Walking….. Mentally coming to terms with the fact that my time as a fighter may be over. Billy My heart says yes, my head says no, I need to wait and see what my body has to say. Billy Simon and Tim put their work and families on hold and stayed up there with me while Eoin drove back to cover all our classes for us. 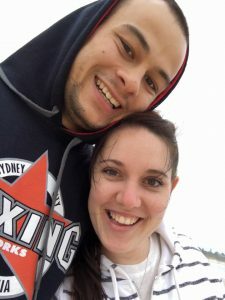 The in flux of support from the Boxing Works community was overwhelming. Billy Yes, for those willing to train at Surry Hills, $120 for 3 x 1 hour sessions, that is a saving of 50%. Must book in before the end of August.